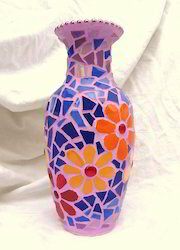 Banking on our enriched industry experience, we are engaged in offering a huge gamut of Glass Flower Pot. We are considered as a specialist in offering the most sought after range of Fine glass flower pot with white metal standing elephant work and carving on glass. These are widely appreciated for their intricate designs and attractive looks. We are a prominent Glass Flower Pot Manufacturer, Exporter and Supplier in India. The Glass Flower Pot, offered by us, help you to fill your surroundings with blossom fragrance of flowers. These Glass Flower Pot can also be gifted to special ones on different occasions. 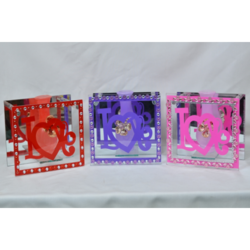 Avail the Glass Flower Pot from us in different designs and sizes. We are indulged in offering the finest quality Round Glass Flower Vase. Designer Glass Flower Pot, Size: Size: Hx3.5"
In order to cater the numerous necessities of the patrons, we have been able to provide a wide range of Designer Flower Pot. We are engaged in providing a wide range of Hanging Mercury Glass Jar to our clients.